ZDoom • View topic - [SPRITES] Spriting Carnival!! GIFMaker produced some black background artifacts. If anybody is looking for some cool bosses for a zombie TC, drop me a line. I can easily modify or add new sprite animations. Maybe I'll also do some normal infected. edit of the terminator rampage m16, now with a grenade launcher attachment. That's some sweet Terminator Rampage edit you got there, LossForWords. I began a Blake Stone player sprite last year, I'm not sure if it has ever been done before. The eyes are the biggest challenge as I wanted to separate him from the baddies in the game. LossForWords wrote: edit of the terminator rampage m16, now with a grenade launcher attachment. That's some nice and precise weapon sprite you got there! I think more of Terminator Rampage weapons needs more love, too! 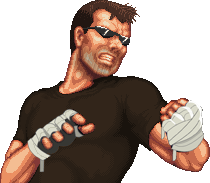 BFG wrote: I began a Blake Stone player sprite last year, I'm not sure if it has ever been done before. The eyes are the biggest challenge as I wanted to separate him from the baddies in the game. I like the Green suit. I thought the head looked strange, particularly the eyes and hairline, so I used one of my old heads that somewhat resembles Blake Stone. 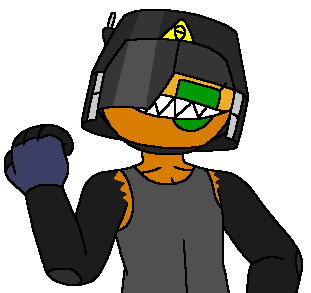 Also recolored the suit. I find its best just to use one color, (the Pupil) for eyes on smaller scaled characters such as this. Being armed for the unkown is better than being a slave to it. awesome job, thank you! that new head fits perfectly and now I'm motivated to finish the rest of the sprite. I'm going to start by swapping out the gloves for his bare hands, and then tweak the white armor to fit better with the back view sprites. While the orange sprite is cool, it might be an idea to do it in green and use a translation in the decorate/zscript to make it orange. That way a minor change of code can be used to easily recolour the sprites to something else. This would be less easy/effective with orange sprites. Finally got around to my Cyberdemon. Last edited by simploo on Tue Jan 08, 2019 3:18 pm, edited 1 time in total. the new version reminds me a bit of d64. Yeah, it has own pros and cons. It looks smooth and well shaded, but it's way too dark at the same time. Looks nice nonetheless! here's an epipen, for overdose-curing and allergy-stopping purposes, even tho that's not where the pen goes. I find that the doom modding scene has very few underwater enemy sprites at its disposal, so I made this mini-sub with full rotations. I have also touched up my tank edit and made it in 3 flavours; cannon, chaingun and flamethrower. There is also a set of a player-controlled tank. Finally, here is a bolt-action rifle in the Doom style. All of these will appear in a project I have long had in the works (well if by some miracle it ever gets finished). You're one of my favorite spriters, glad you're back.